First I will introduce the steps to create the oral presentation, and second we will look at some tips for the format and the style. Remember that the stress before giving an oral presentation is normal, and even beneficial – it will give you the energy and motivation to prepare a good presentation, and preparation is key to delivering a memorable speech. Good preparation will also give you confidence, which in turn will make speaking in front of your audience easier. The five steps to follow to prepare a good presentation are simple to remember: they are the ‘BASIS‘ steps. Let’s look at each step carefully. Brainstorming means putting on paper all the ideas that are connected to the topic of your presentation. You can brainstorm alone or with colleagues. Ideally you should take a sheet of paper and write on it all the information you know and all the ideas you have about this topic. 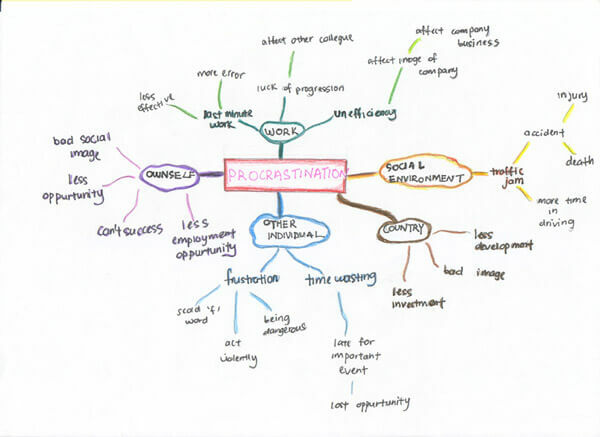 A common way of brainstorming consists in writing the main topic inside a circle at the center of your page and then jotting down all around it the ideas and information connected to it. You can use arrows to indicate relationships. Knowing who you will address is vital as it determines what information you need to select from your brainstorming session. Keep only the information that is important to your audience. If you add unnecessary information, you will end up losing your audience’s attention and your important message will get lost. So select carefully what to include in your presentation. Another important reason to know your audience is the degree of formality that you need to use. For example, how to address the listeners (“Ladies and Gentlemen” as opposed to “Hi everyone”), and whether or not to include humor (but I will come back to that later). Make sure you find out who your audience will be before preparing your presentation. 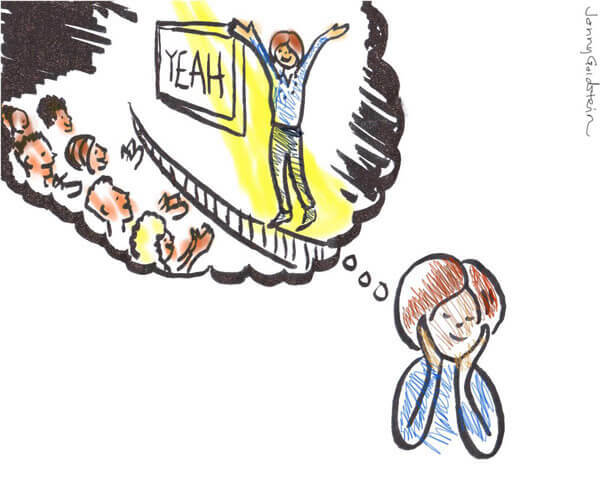 Visual aids are key: they help you to remember what to say, and they help the audience to understand your presentation. However they need to be used wisely. Most presentations will have slides, which can be designed with various software programs (e.g. PowerPoint, Open Office Impress or Prezi). Because your slides contain the information about your topic, you do not need to memorize your whole presentation, nor do you need to use clumsy paper notes, and so your hands can move freely during your speech. include as many pictures (or graphs) as possible – a picture is worth a thousand words. Now that you have designed your slides, you need to accompany them with explanations. This step is the most difficult one if English is not your native language. You need to prepare the explanation for each slide. In order to describe the idea in each slide, you need to use precise vocabulary combined with correct grammar – and to deliver both fluently. So, sit back and look at each slide, then say out loud (or do it mentally if that is not possible) what you will say in front of your audience. Describe each idea with your own words in the most natural fashion, as if you were explaining it to a friend or to a close colleague. If you do not know some terms, look them up in a dictionary and write them down. However, resist the urge to write a script for each slide. 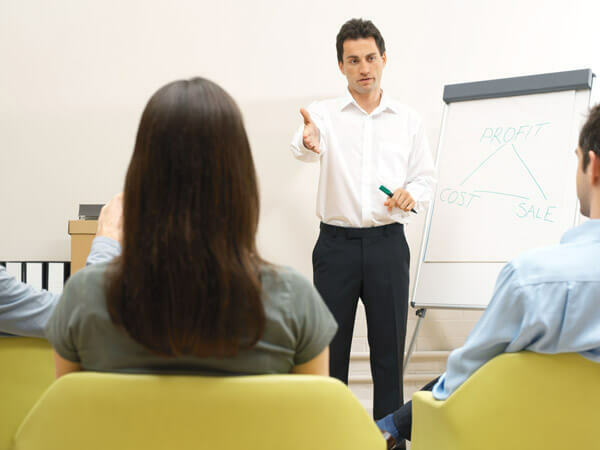 Written speeches generally get in the way of effective communication as the speaker ends up reading a script instead of talking to the audience. Only talented speakers can make written speeches sound natural. Also, rely on what you already know in English. Now is not the appropriate time to venture into grammatical constructions that make you feel uncomfortable. There are many ways to express ideas, so use the words and grammar that you know well. The final step is simulating the actual presentation and it is essential to the success of your presentation. Assess your performance a second time. You can use a simple video camera, your smart phone, a digital camera or even a webcam. However, it is important when you film yourself that the camera focuses on the upper part of your body, so that you can assess your body language. First, because this will likely be your position during the real presentation. Second, it is a position that opens up your lungs and helps you to breathe better (which is very important to speaking loudly and clearly). Finally, it allows you to move and to accompany your speech with gestures that emphasize the meaning of your words – and so improves your communication. After you have filmed yourself, watch your presentation with a critical eye – give yourself both positive and negative criticism. They are many aspects to oral communication besides the words you say – your voice, body and eyes need to complement your speech. Once you have used the self-assessment to identify your communication problems, you need to address them: correct the English mistakes, improve your voice or your body language, and film yourself a second time. Then assess your performance again with the same self-assessment grid. If you are happy with the result, you are ready for the final show. If not, you can continue to rehearse the presentation until you feel ready. Depending on time constraints you can choose how many times you practise your speech before the actual performance, but remember that practicing it is not optional: if you want to deliver a good presentation, you have to practise it first. A final consideration goes to the room where you will give your presentation: if possible, practise in that room, or at least get familiar with it (check where the switches for lights, screens, projectors, etc. are located). 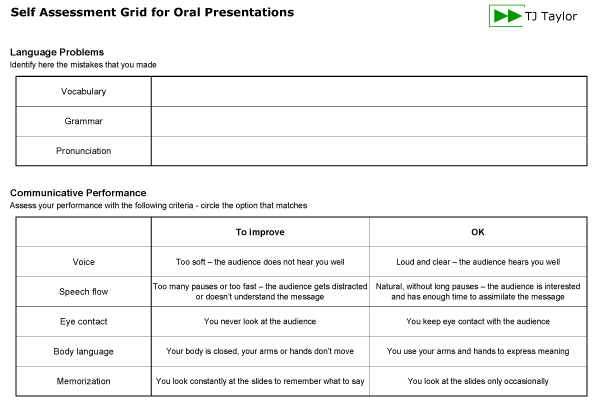 Your oral presentation should have 3 parts: an introduction, a body, and a conclusion. Your introduction presents the topic and gives an overview of the presentation, the body contains the information, facts or ideas, and the conclusion summarizes the ideas developed previously. Repetition helps retention: if some information is important and needs to be remembered by your audience, be sure to repeat it. For example, mention it in the body and in the conclusion. Then tell them what you have told them. Keep it short and simple: remember that too much information will only result in your audience remembering nothing. 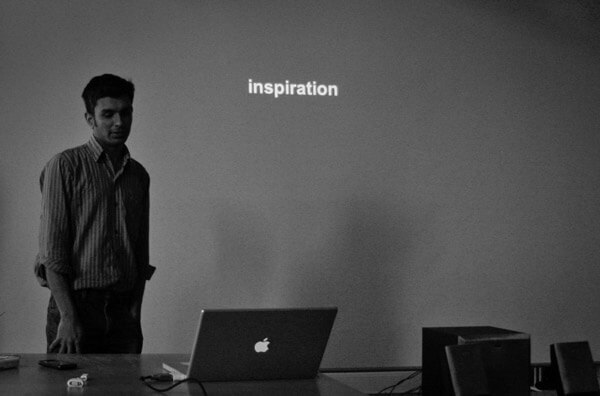 Present only the important ideas in your slideshow, and repeat them in the conclusion. Be credible: avoid spelling mistakes and mispronunciation. You might be a very talented professional but your presentation will be less convincing if it contains errors, spelling mistakes or mispronunciation of English terms. You need to pay special attention to spelling and pronunciation in titles and keywords as well as in the introduction and the conclusion. Use spellcheckers to check the spelling of your slides and online dictionaries to listen to the pronunciation of words (such as the Cambridge Dictionary). Avoid humor. Although humor can be helpful to defuse tense situations, it can also be dangerous and unpredictable. What makes you smile or laugh might be offensive to a foreigner. Unless you know your audience well, refrain from using humor in professional presentations as it might lead to the opposite effect. Engage the audience. When you deliver your speech, you need to establish a relationship between you and your audience. A good way to do that is to keep eye contact and to ask questions. You can ask direct questions and the audience can answer verbally or physically (by raising their hands, for example) or you can opt for rhetorical questions, which are questions that do not require answers. For example, you can introduce a slide with the following rhetorical question: “So how can we address this problem?” and then you give the solutions. Or start your conclusion with “What have we learnt so far?” and repeat the important ideas. 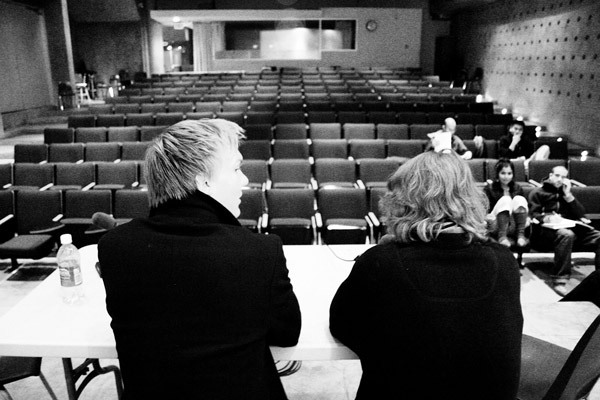 Asking questions is a good way to keep your audience attentive and to put rhythm into the presentation. 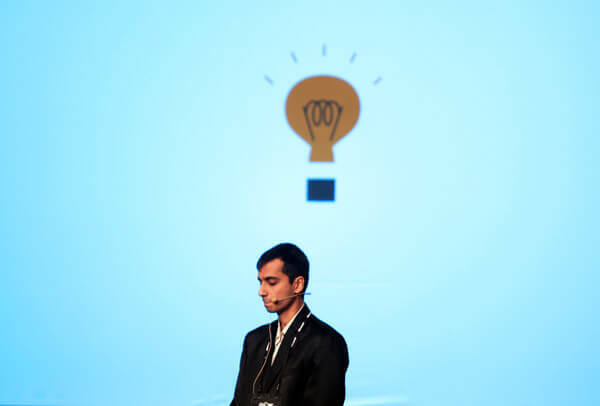 You are now ready to stand up in front of your audience and deliver a memorable speech. Relax, take a deep breath, and just do it. In conclusion, remember that the more oral presentations you make, the more confident you will be and the easier they will become. View every opportunity to make a presentation as a challenge and as practice for your next big presentation! Have you found this article interesting? Which tips will you try out? Tell us by adding your comments below – I look forward to reading your feedback.